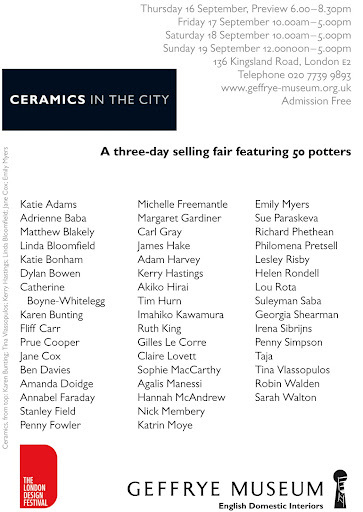 I need to pack up my pots for Ceramics in the City over the next day or so. I do like this show, not least because it means I get to see my friend Annabel again who very kindly lets me stay at their house for the duration of the show, and lets me have my boxes couriered to her house as well so that I can sit on the train and not have the hassle of driving down to London. What a gem she is, I do like that she shows me great places in the city too that I probably wouldn’t find on my own, and we have a good time together. I’m looking forward to seeing her again. This year I have been asked to do a demo at the show, this is not something I am used to really but something I probably need to get more accustomed to. It’s 45minutes and I can do a slide show or a talk or demo or a combination of that. I am hoping to manage to get some sort of slide show together and then I am hoping that I will be able to throw something once I get down there that I can slip and decorate during the demo. I do need to get my head around that a bit more before I go. Any advice / thoughts / suggestions gratefully received. 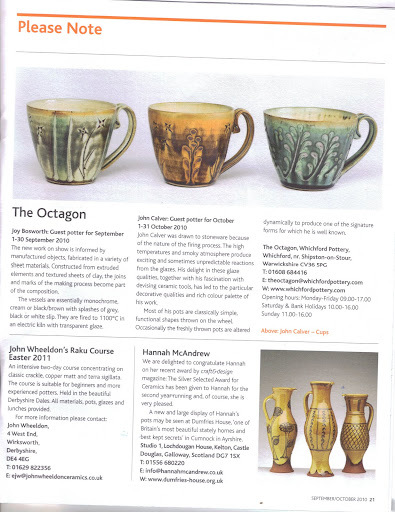 As I say demonstrating is something I do need to get used to as I have just been asked to be one of the three demonstrators at the Scottish Potters Association annual workshop weekend at Kindrogan for 2011. It’s very scary, I’ve attended the event for the last four years or so and my goodness there have been some crackers demonstrating, the likes of Ruthanne Tudball, Mike Dodd, Richard Godfrey and then in the slipware vein for the last two years we have had Doug Fitch and Paul Young, hmmm, no need to worry, not that those two create one hell of an act to follow for anyone making slipware. Gulp! I think I’m different enough to be able to give the members something new to see there. It’s very very nice to be asked to do it, I only hope that I can do them justice. Plenty of time to practise for that one though, it’s not until March. A big thank you to Kathy Niblett, editor of the CPA News who popped this little piece in the latest edition of the newsletter. Those jugs are turning up all over the place, just goes to show what a difference having good images makes. This week I sent off on it’s merry little way the slip trail jug that I decorated with the apple eating dragon and the Funny Little People, it is as we speak winging it’s way to Minnesota, in fact I have just tracked the parcel and it is at the depot as you weren’t in when they tried to deliver it Lloyd. How incredible is that? It was collected from me at 4pm on wednesday and it was delivered yesterday in the middle of America. Fantastic service. That reminds me the second parcel did indeed turn up in Inverness the very next day – phew! Finally, does anyone else have a thing sometimes were comments are left on your blog and you get an email telling you that it’s there and then you go to it and it’s not there? I have one a week or so ago on an old post from May or so and I went to respond to it but something distracted me and then when I went back the second time it wasn’t there anymore. Very odd I thought. Right that’s all from me for the minute, have a good weekend all. 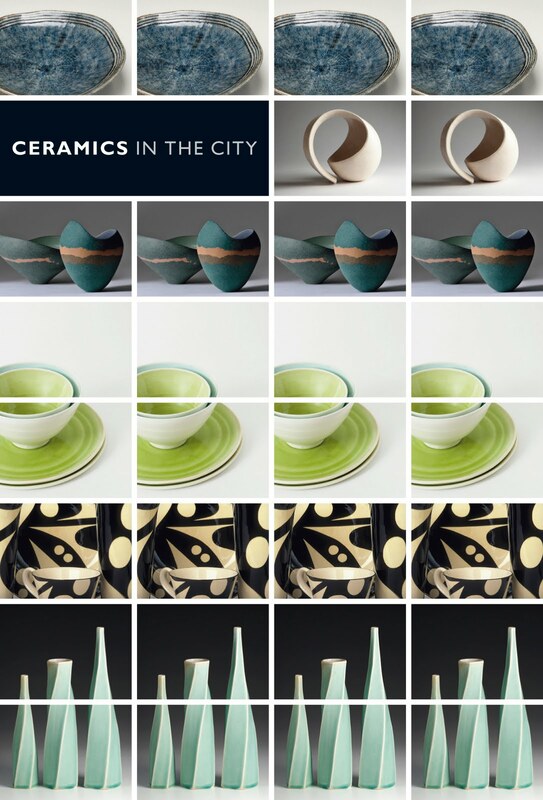 This entry was posted in Ceramics in the City, CPA, CPA News. Bookmark the permalink. Hi Dave, is that out? I had a look and couldn't see it. Is it th eone with the daisies? Congrats for the silver award and for the growing demand for you and your work. Wonderful! I hope you find that you enjoy demonstrating. A weekend of demonstating at the SPA, and there's me worrying about a DAY! What are you like, nothing seems to phase you, I'm in awe. Hope the trip south all goes well. Hi Tim, Thanks, do introduce yourself if you come to the show. It'll be good to meet you.Christine, haven't had time to worry, they only just asked. I'll try not to worry intil it actually gets to March else I'll get nothing done BUT worry! As for nothing phasing me – it's that duck paddling away frantically under water thing!